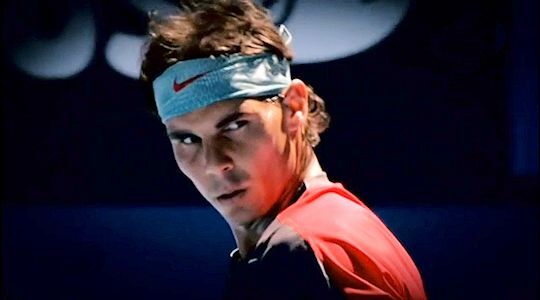 Week two started with Rafa's fourth round encounter against Kei Nishikori. It wasn't the easiest match to watch by a long chalk. 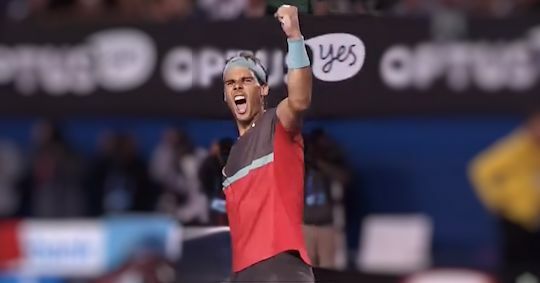 Elise summed it up on our messageboard - Rafa triumphed over his blistered left hand, his inspired opponent, a fall, a broken shoelace and a hostile umpire to advance to the quarter final. He was asked about his hand in the post-match press conference. " The problem is not the blister. The problem is the place. Is very difficult to cover that blister here. Is not painful, but I cannot play without that cover today. Is a little bit hard because with that cover, is true, that you can imagine that is something that I didn't use never. I used one time in my career, or twice. Is different than the ones I am using every day, that I already feel the ball, feel the racquet with all that. That's something new. The feeling on the racquet is a little bit more difficult." But he refused to blame the blister for his performance. "Some days you play better, some days you play not that good. I didn't play bad today, but I didn't play as good as I did two days ago. But the victory of today has much more value than the victory of two days ago. Because when you are playing that good, the normal thing is win. When you are playing normal and the opponent is a good one, you are able to keep winning, that's have much more value." He talked at length about the time violations he received, summing it up thus, "I going to try to go quicker for the future. But is important to have people on the chair that really understand the game and people who manage this sport who understand the game, and that's it." It took more than 3 hours but he defeated Nishikori in straight sets, 7-6(3), 7-5, 7-6(3). When the draw came out we were expecting Rafa's quarter final to be against Juan Martin Del Potro and were quite relieved when he lost in the second round. However, this meant that he had to play Grigor Dimitrov who has given him a tough time every time they've played. It was no different this time. Dimitrov took the first set and this was followed by two nail-biting tiebreakers. The continuing issues with the blister on his palm meant his usually reliable serve deserted him at a couple of key moments. He acknowledged afterwards that he felt "very lucky" to have won the third set. It all came a bit more together in the fourth set, though, and he pulled out a 3-6, 7-6(3), 7-6(7), 6-2 win. If one paid too much attention to the pre-match hype for his semi final against Roger Federer, you could be forgiven for thinking that this was going to be extremely tough. By many accounts, Federer was back to his 2006-2007 best. Now we all know that for a fit Rafa even this would not pose too much of a problem. But how much would his blister prey on his mind? Not as much as Rafa preys on Federer's mind it would seem. The opening set was close. Rafa missed three break point opportunities (or Federer saved them) but he edged the tiebreak. The next two sets were a bit easier although he did concede a service break in the third set. Since he broke Federer three times in that set, though, this was a mere blip. His 7-6(4), 6-3, 6-3 win moves the head to head up to 23-10 in Rafa's favour. So the dream result was not to be. Rafa was beaten in the final by Stanislas Wawrinka, 3-6, 2-6, 6-3, 3-6. This cannot have been entirely unconnected with the back injury Rafa sustained before the match. He said, "The back, since the beginning I felt a little bit, from the warmup. It was a little bit worst in the first set. End of the first set, I start to feel worst. Then at the beginning of the second was the key moment that I felt, during a serve in a bad movement, is very stiff, very bad." We can only hope that it is nothing serious. 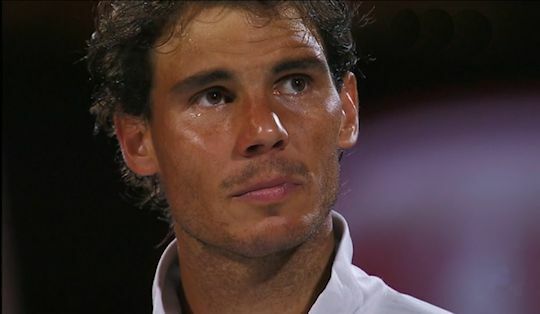 Rafa showed what an amazing champion and role model he is to all of us in his post-match press conference. He was far more magnanimous than I would ever be able to manage. "Is the moment to congratulate Stan. He's playing unbelievable. He really deserve to win that title. I am really happy for him. Is the Stan day, not my day. " And, yet again, he voiced his amazing philosophy. "I'm obviously disappointed and very sad about what happened. But that's life, that's sport. I really had a lot of great moments in my career. That's a tough one. Just accept and trying to keep working hard for what's coming. Is not the end of the world. Is just another tough moment. Is not the first. "I feel very lucky that I was able to enjoy much more happy moments than tough moments. At the end is a sport of victories. People remember the victories, don't remember the loses. "For me is a tough one tonight because I felt that I was ready to compete well. But in a few weeks that's going to pass. I'm going to keep playing, going to keep training hard, and I'm going to keep enjoying the world of tennis. "I feel very lucky to be able to work in something that I really love to do. Not everybody's able to do that. Nothing wrong. Just bad day, tough day. But lot of people in the world have lot of very tough days. I am not this kind of person, so I feel very lucky." Right now I am bursting with pride in him. We are enormously privileged to be fans of this wonderful champion and incredible human being.